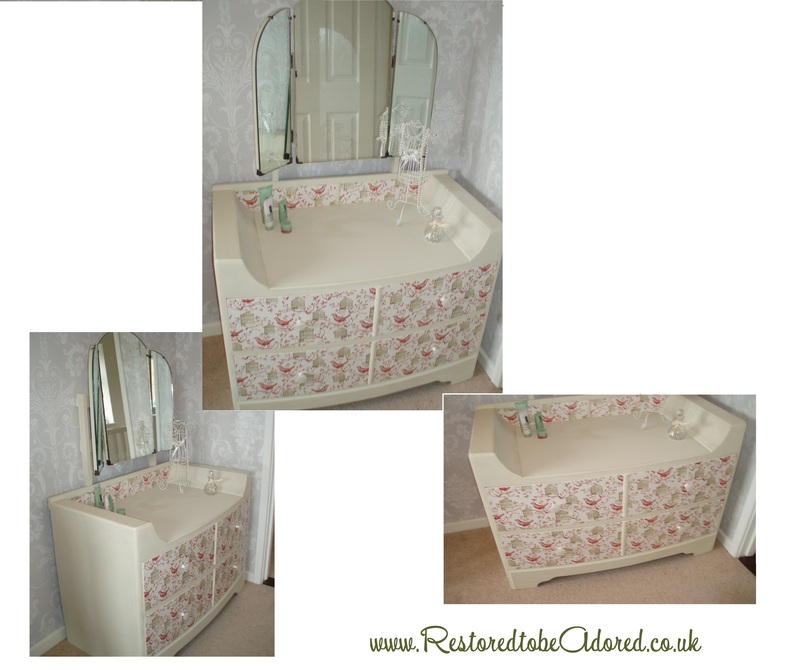 A hand painted Mid 20th Century Dressing Table, with 3 way mirror. This stunning piece has been painted in the fantastic `Antique White ` ~ Autentico; pure and natural paint, this is a classic creamy vintage white. This beautiful and unique piece benefits from decoupage draw fronts with stunning bird paper from Cavallini Papers, which has then been varnished to protect. Autentico clear wax has been utilised to seal and protect the paint. As this piece has been hand painted there may well be signs of texture, so it is not for someone looking for a factory finish. With fantastic storage capability this is a fantastic vintage piece, a definite show piece for your bedroom. As a preloved character set it has the associated knocks and dings that vintage and reclaimed furniture picks up from age and use, however this is piece has been well looked after and is in good condition, there is a slight aging on a very small bit of the mirror which really just adds to the vintage feel. Each draw is 8 inches/20cm deep. You can buy with confidence, I use the eco-friendly ~ Autentico; pure and natural paints, waxes and sealants. These paints provide a fantastic lightly textured and matt finish which is perfect for the shabby chic look. You will be able to see light brush marks where it has been handpainted adding to the character of my pieces. Only good quality products including high quality fabrics are used, please visit my suppliers website for full details, for this piece; www.autentico.co.uk, http://www.cavallini.com/.